The cigarette beetle is a small, squat (3mm or 1/3 inch), brownish-red, convex beetle that infest many types of dried plant and animal material. It resembles the drugstore beetle but is lighter in color and does not have the lines of pits on its wing covers. Cigarette beetle antennae are serrated while those of the drugstore beetle end in a 3-segmented club. The head is often tucked under the prothorax and is not visible from above. It is a member of the family Anobiidae and could be confused with the wood-boring species of that family. If Anobiids are found in association with food, they are most likely either the drugstore beetle or cigarette beetle. The larvae are whitish C-shaped grubs with well-developed legs. Females lay about 30-40 eggs over a period of several weeks. Eggs are laid singly in crevices, folds, or depressions in the food. The eggs hatch in 5-6 days at 95°F, but may take up to 22 days at 68°F. Low humidity generally inhibits hatching, with the effect becoming more pronounced above and below 86°F. The optimum relative humidity is 70-80%. Newly hatched larvae are very active and begin crawling throughout the food. Larvae avoid light and will seek out very small holes, infesting packaged goods. They easily enter spice cans apparently through minute openings in seams or around lids. Older larvae are also negatively phototactic but are much less active. The number of larval instars ranges from 4-6, depending on temperature and relative humidity. Larvae become inactive at temperatures between 60 and 66°F and enter dormancy at temperatures below 60°F. Five to ten weeks after hatching, larvae construct a fragile pupation cell of food and waste materials cemented together with secretions from the midgut. The pupal stage requires 4 days at 86°F -90°F to 12 days at 68°F. The length of the pupal stage is not influenced by humidity. Adults remain within the pupal chamber until the cuticle hardens, a period that is dependent on temperature (not humidity) (4 days at 70°F to 12 days at 68°F). The entire life cycle may take up to 90 days to complete, depending on temperature. Immature stage mortality is very dependent on the commodity upon which the larvae develop. Adults are short-lived, the lifespan depending on temperature and humidity and the mating/nutritional status of females (mated females deprived of food live longer than fed females). Males live 21 days at 95°F to 43 days at 68°F, while females live 18-46 days within the same temperature range. Adults are strong flyers and are active at temperatures above 65°F. In temperate climates, swarms may be seen as early as late April-early May. 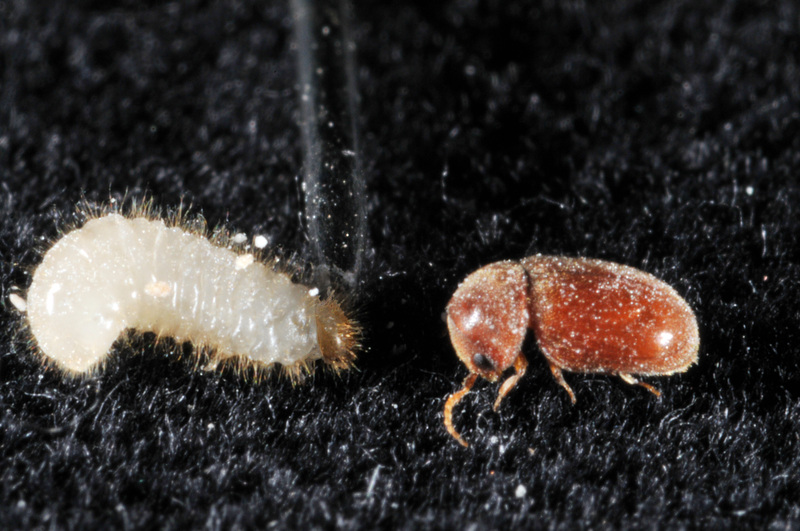 The winter is usually passed in the dormant larval stage, however in most processing plants, retail markets and homes, this insect is active year-round. They can be found in many food products including aniseed, areca nuts, bamboo, beans, red pepper, ginger, nutmeg, licorice root, cumin, paprika and other spices, drugs, tobacco, raisens, teas, insecticides containing pyrethrum, and other dried foods (beans, coffee beans, flour, wheat flour (including atta), fruit, carrots, cabbage, dates, biscuits, chickpeas, peanuts, meal, breakfast cereals, fish, and dog food). They also can feed on wool, hair, leather, horn, paper, and museum specimens. The only way to control this pest is fumigation. Since it is an internal pest, residual control will only kill exposed adults. To kill the internal stages (larval & pupal), you must fumigate. 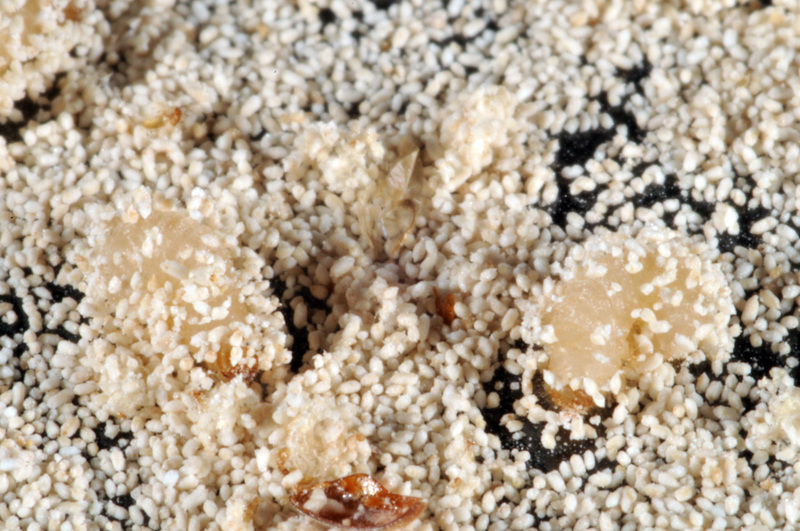 Heating grain to 60˚C can kill larvae, however, this may decrease germination and baking quality of flour. READ AND FOLLOW ALL LABEL INSTRUCTIONS. THIS INCLUDES DIRECTIONS FOR USE, PRECAUTIONARY STATEMENTS (HAZARDS TO HUMANS, DOMESTIC ANIMALS, AND ENDANGERED SPECIES), ENVIRONMENTAL HAZARDS, RATES OF APPLICATION, NUMBER OF APPLICATIONS, REENTRY INTERVALS, HARVEST RESTRICTIONS, STORAGE AND DISPOSAL, AND ANY SPECIFIC WARNINGS AND/OR PRECAUTIONS FOR SAFE HANDLING OF THE PESTICIDE. This work is supported in part by Extension Implementation Grant 2017-70006-27140/ IND011460G4-1013877 from the USDA National Institute of Food and Agriculture.